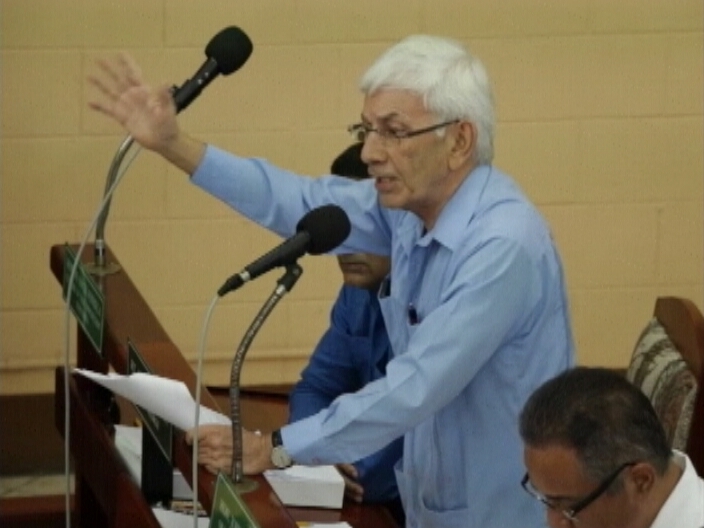 Budget Day in Belmopan is typically quite straightforward as the presentation of the revenue and appropriations bill takes center stage. But these days, there's always more stuff happening. So today, the teachers union staged its national rally and demonstration in Belmopan to coincide with the budget presentation - even if the centerpiece of that Budget was to give them a raise of pay - the teachers who went to Belmopan still aren't happy - and they made their presence felt all through the prime minister's speech as they sang and vocalized outside on the national assembly stairs. We'll have a full report on that shortly, but that wasn't the only distraction at today's House Meeting. At the end of the meeting, at least one blow was thrown right in front of the House - and right when the representatives were walking out. 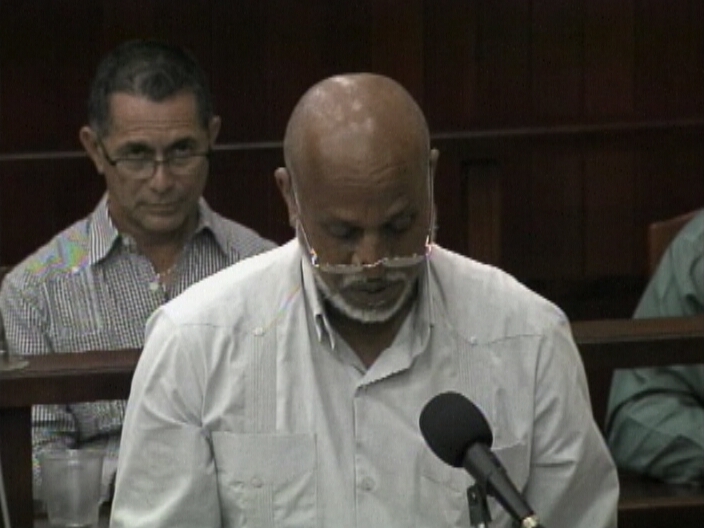 It was a dispute between the PUP's Vaughn Gill - who was all upset about Anthony Boots Martinez getting land for his constituents in Cayo south - where Gill is the PUP political officer. That got really heated - and we'll show you as much as we have of it later on. "This is a train bound for glory and we have the will and the wherewithal to drive it straight on through. Truly 2014 is a sort of annus mirabilis, a year of miracles under this United Democratic Party Government." "This source of bilateral support has yielded some $168 million. So far, $10 million has been invested in the start-up of the National Bank, about a million in the commencement of works by the Belize Infrastructure Ltd, and around $15 million in the national infrastructure renewal program launched after last year's epochal floods." "There will be no existential agonizing for us, no dithering. We are inheritors of the Baymen's legacy and we meet adversity resolute and clear-eyed. So whether it is replenishment of crops and rescue and repair of livelihoods after the worst rains in a generation; whether it is intervening in the sugar industry to empower justice, rehabilitate roads and enable a crop; or whether it is promoting reconciliation, providing bailout money and avoiding factory closure in citrus, Belizeans can be sure of one thing. This Government will always take arms against any sea of troubles and by opposing end them." "Teachers and Public Officers with this Budget, this Budget, Mr Speaker, are receiving the nectar of a not less than 5 percent salary increase on top of the annual 2.5 percent increment. Altogether this translates into around 34 million dollars "
"Unfortunately, notwithstanding Government's extraordinary munificence, there seems to be in some quarters ingratitude "sharper than a serpent's tooth". But we will not allow that to rain on our grand raise-of-pay parade." "Despite our disagreements with some of the Union Leaders, we tremendously value both our Public Officers and Teachers. We believe in them, we treasure them and we consider it our special obligation to properly reward them. Thus, we were and are happy to make and live up to this commitment. And we consider its fulfillment the centerpiece of this Budget." And, while Government does have that 22 million to pay the teachers this year, what about next? Well, that will take care of itself - because Barrow who's bent on expansive public spending, also signaled a sharp shift from the strict fiscalism that had become the UDP's calling card under his predecessor Manuel Esquivel. "And that is the objective in modern times: to balance the economy, not the Budget. Now a country can spend more than it earns because of the availability of debt as an instrument to fund investment and construct the pillars for accelerated growth." 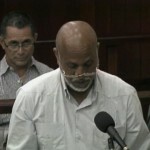 "True sunshine is breaking out all over Belize and we in the UDP are messengers of the day. In this refulgent dawn those that can't see the many good things around us must be blinded by the light." The budget took one hour sixteen minutes to deliver, compared to last year's one hour and fifteen minutes. It will be debated starting on Monday, March 24th. 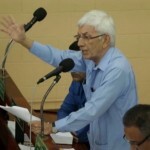 But the former Education Minister Francis Fonseca was not impressed with the raise of pay that the Prime Minister was beating his chest over. Instead Francis Fonseca was chanting reggae lyrics:..
"The Prime Minister's budget presentation almost moves me to sound. I'm reminded of the Morgan Heritage tune "ends nah meet, dem ah seh dat tings di get betta, but we can't feel it, dem ah seh money di run, buy we can't see it," and I think that is the overwhelming response of the Belizean people to the flowery empty rhetoric we heard this morning. It is a budget divorce and disconnected from reality like this UDP government. That is my initial reaction to the budget, obviously we will pour into the details of the numbers and look at it and give a very comprehensive response at the time of the budget debate." 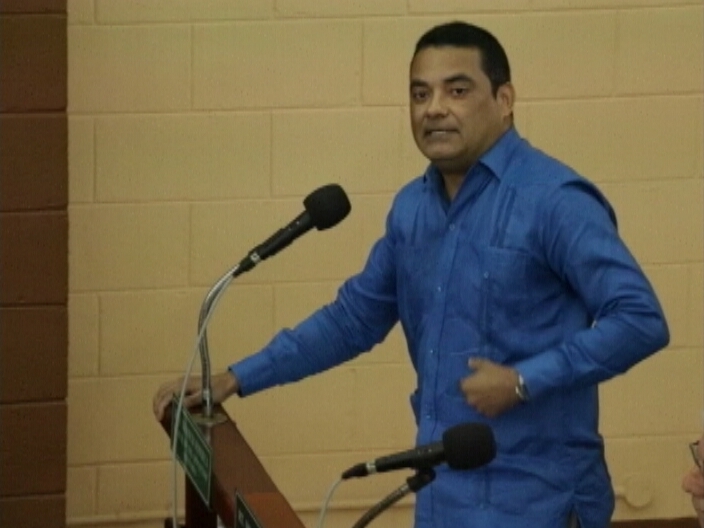 Fonseca will lead the budget debate in two weeks' time - no word yet on whether he will be inviting the Morgan Heritage Band to fill the back-bench. Debate of the proposed budget for the new financial year begins next week; both sides of the aisle in the House of Representatives are going through the budget with a fine tooth comb. The theme for the 2014-2015 Budget is Bettering People, Building Belize – A Budget for all. 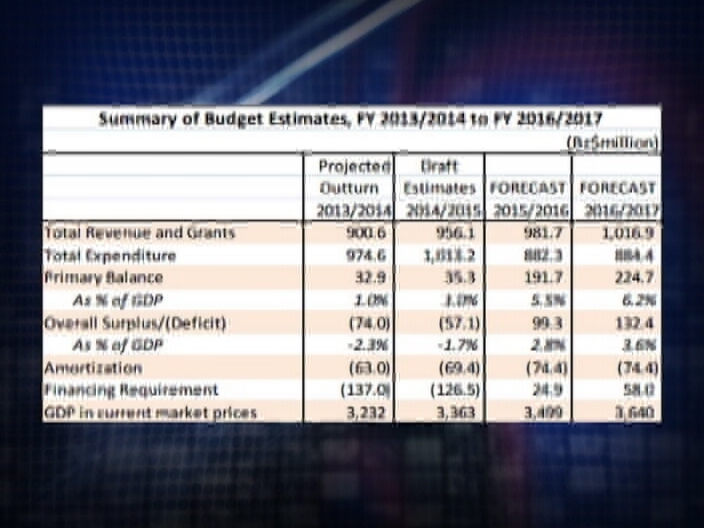 Tonight, Isani Cayetano has an overall look at budget and how government proposes to fund expenditure of a billion dollars. 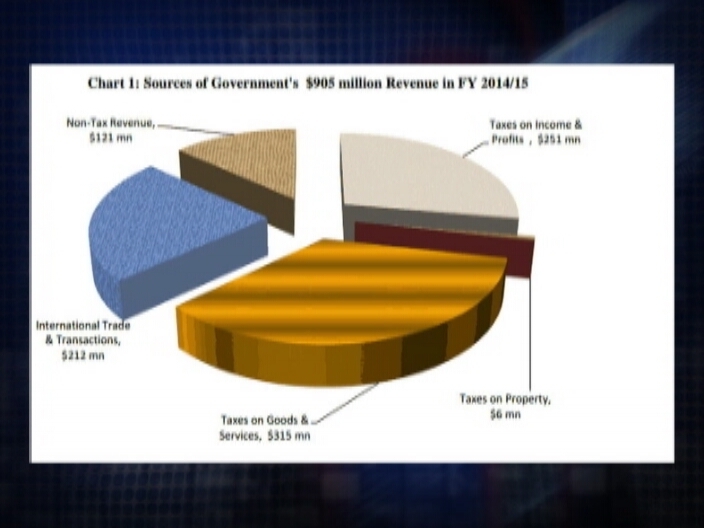 The proposed national budget for 2014, prepared by the Ministry of Finance was presented by Prime Minister Barrow in the House of Representatives last Friday. Belize. The financial plan focuses on an initial primary surplus of one percent of the gross domestic product, not including the remaining interest payments on government’s existing debt. 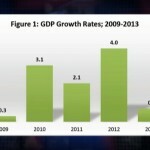 The GDP, an overall income exclusive of foreign direct investment, grew by a sheer zero point seven percent last year. 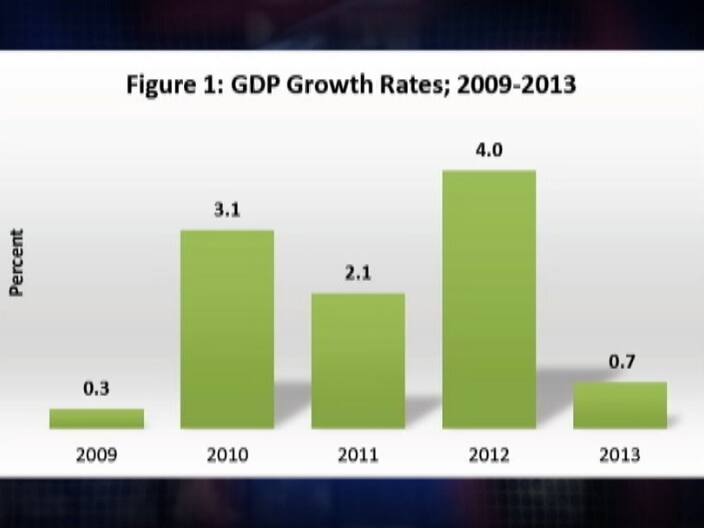 The difference in GDP between 2012 and 2013 is a three point three percent contraction of the growth rate of the economy. 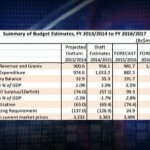 Despite the significant reduction, government plans on spending one billion dollars during the upcoming twelve months. That figure is being offset against a forecasted revenue of nine hundred and fifty-six million dollars, an overall shortfall of fifty-seven million dollars or one point seven percent of GDP. Additionally, the cost of paying off government’s debt in installments amounts to seventy million dollars. That’s a total of one hundred and twenty-seven million dollars between the deficit and the loan amortization. To cover the outstanding balance G.O.B. will take on a three-pronged approach which includes a forty-eight million dollar loan to fund its Capital Three Expenditure Program, twenty million dollars in budget support financing from the Taiwan International Cooperation and Development Fund and fifty-nine million dollars from Venezuela’s PetroCaribe initiative. Where revenue is concerned, G.O.B. has identified five primary sources which it hopes will meet its nine hundred million dollar target in projected collection. The following pie chart indicates that the largest sum will be derived from taxes on goods and services, a total of three hundred and fifteen million dollars. A secondary raft of roughly two hundred and fifty million dollars comes from income tax, while the third and fourth tranches of two hundred and twelve million dollars and a hundred and twenty-one million dollars, respectively, will come from international trade and transactions and non-tax revenue. If government realizes that quantum by the end of March 2015, then public officers, senior managers and teachers would continue to benefit from the salary adjustment. The existing agreement sees a commitment of half of the difference in actual recurrent revenue performance going forward. The annual budget debate 2014, held on Monday and Tuesday, has been widely described as anticlimactic, primarily because majority of the arguments in the Honorable House revolved around the many personalities that comprise lower parliament. From literary references to stolen speeches and criticisms of prime ministers past, little was left unsaid, save for an actual discussion on the upcoming national expenditure. Tonight, we look back on some of the highlights of the verbal exchanges during the two-day sitting, including the quotable and the hilarious.